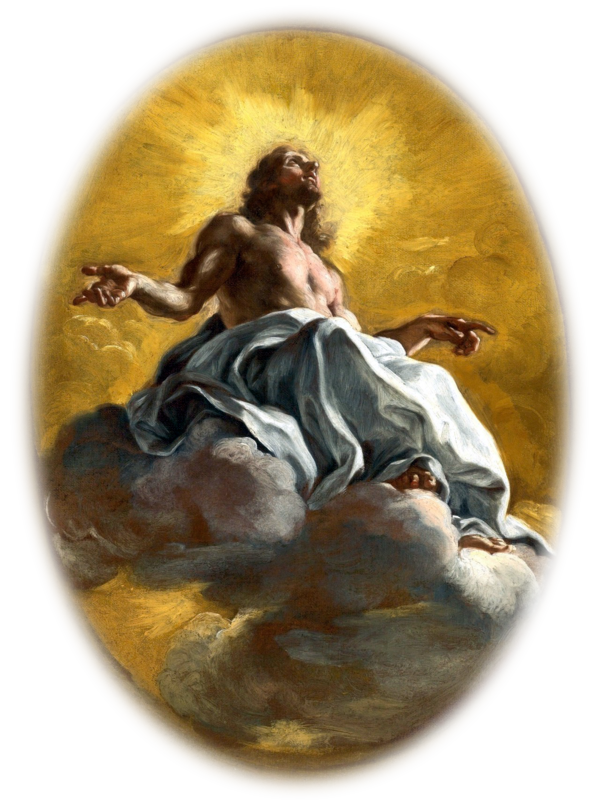 Christ in Glory, by Giovanni Battista Gaulli (Il-Baciccio). Adapted from a copy found at rev-artistry. Happy Easter, friends! 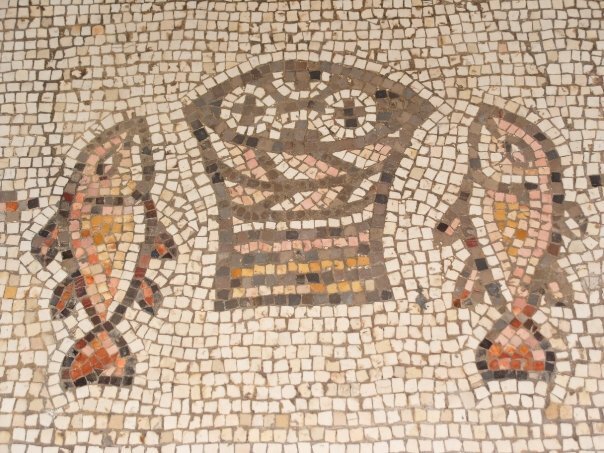 I hope your Lenten season was fruitful and that your Easter season will be richly blessed. My own recovery continues and I’m feeling more and more like myself again. And happy to be back here and active on the site, too. Have a great Easter weekend, y’all. God bless you. May His peace be always with you. The Holy Rosary has been called “the Bible on a string.” In the Rosary we pray and meditate on the Life of Christ, coming face to face with the True God and True Man, Jesus. *Translation: The Lord is risen indeed. Praise the Lord! Part, the first: I haven’t decided on a format yet for the Rosary Project pages. I put a page together for the First Joyful Mystery using an image gallery, but I’m not convinced that that is the way to go. The gallery may make it easy to browse the images, but it makes them smaller than I would like. Larger images are not only more impressive, but they lend themselves more to meditation. Don’t you think? I’ll put together a page that more closely resembles the way the threads appear on Twitter, with a whole set of Mysteries on one long page. And I’ll also put the Mysteries on separate short pages, too. I’ll do it a few different ways so that you, the reader, have options. And since I don’t have to deal with 280 character constraints here, I can also add information about the artwork, name of the artist, links, and other interesting stuff. Btw, the images are all in the public domain. I’ve scoured the web to find as many good ones as I can. And I still find new things every day. If this keeps up, pretty soon I’ll need more external drives. Another reason to put affliliate links on the blog. Behold! A screenshot of the first ever affiliate links to appear on Catholic Heart & Mind. Thanks for reading. I hope to hear from you soon! Began a new page for the Rosary Project today. Was going to start uploading it, but changing the blog theme and layout meant re-doing more than I had planned, what with site navigation and all. * If you’re curious about what the Rosary threads are, here’s the one from last night (Tuesday, April 16). *But that’s alright. I haven’t changed the blog look for years other than to add a new banner now and then. It was time for a new look and to clean out some under-used pages, or at least move them around. **Scribbling is what I do when I want to work on a story but all I can do is scribble a few disjointed impressions of a scene here and there with no idea how it will fit into the larger picture of whatever story I’m working on. My goal is to eventually put a few of these stories up on the blog. And maybe one day even put them into an eBook. It happened, I think, at least partially because of the way I was posting the Psalms project: using a third-party app and posting separate Tweets instead of a thread. All those Tweets may have looked like sp@m. That’s one reason I haven’t posted any of that project in a while. Also I was archiving the posts as threads at Storify and that site shut down on the 16th of this month. Bother. The other reason is that I suffered a heart attack a while back and nearly died. Recovery continues, slowly as it seems to me, not so slowly according to others. If you followed me on Twitter, then you know I didn’t blog through the long hospital stay but did live-Tweet it. So many Twitter updates, so many people praying for me. God is good and my family and friends, both the ones I know face-to-face and those I know only online, saved my life, I’m sure of it. A few days ago I lost Wheelchair Dawg—my oldest, my nearly constant companion for almost fifteen years—to cancer. Heartbreaking does not begin to describe that loss. Her sister from another mother, Lucy, misses her terribly, too. There is a hole in our hearts and in our pack. Fortunately for both of us, Lucy is a cuddle bunny. Cuddles are helping us both right now. I have so many things to write about, but have not had the energy to write, or not the energy to begin, or if the energy to begin, then not the energy to continue. That is changing now. I’m going to try to post often(ish), even if the posts are brief, to stay in touch. God bless you, dear reader. You are in my prayers. Please keep me in yours. Peace be with you. “[I]t has been granted to you that for the sake of Christ you should not only believe in him but also suffer for his sake…” — Phil. 1:29, RSV Second Catholic Edition, Ignatius Press. Is any one among you suffering? Let him pray. Is any cheerful? Let him sing praise. Is any among you sick? Let him call for the elders of the Church, and let them pray over him, anointing him with oil in the name of the Lord; and the prayer of faith will save the sick man, and the Lord will raise him up; and if he has committed sins, he will be forgiven. Therefore confess your sins to one another, and pray for one another, that you may be healed. The prayer of a righteous man has great power in its effects. — James 5:13–16, RSV Second Catholic Edition, Ignatius Press.